Just a month or two ago there were record numbers of sea lions at Pier 39 in San Francisco. Now it seems they are all gone. 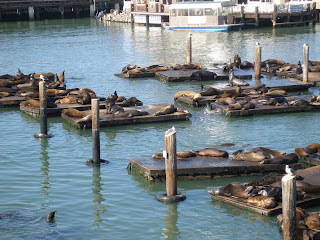 I've been to Pier 39 when there have been lots of sea lions, as well as when there have been not so many. It's my understanding that the numbers are seasonal as the sea lions migrate for food or mating. However, the current situation seems to be unusual, since there don't appear to be any sea lions. Thanks for checking out PIER 39’s live sea lion web cam! Our sea lion friends are temporarily seeking out alternative food sources, but we expect them to return very soon. In the meantime, check out some photos we took of them over the past few months, and make sure to check back as we await their arrival back to PIER 39! The sea lions were fun to watch and quite the tourist attraction. Pier 39 is home to the Sea Lion Cafe which is adjacent to the docks the sea lions normally habituate. I hope the sea lions return to Pier 39, because they are certainly not a sight to miss and one that will be missed if they don't return.